It is one of my favorite times of the year. There are so many fruits and vegetables in peak season right now: dark leafy greens, peppers, cucumbers, tomatoes, corn, peaches, berries, figs, plums, potatoes, and so much more. Farmer’s markets are saturated with rainbow bundles of produce. Baskets and buckets are overflown with seasonal goods and people are stocking up on all they can while the season is still rich with yield. With so many fruits readily available, it’s no wonder we find ways to use them in every dish. Whether it be salad, sorbet, juice, cocktails, sauces, jams, compotes, or cakes, there are so many ways to incorporate fresh fruit into a dish. One of my favorite ways is with fruit and dough --- and let's be honest, anything wrapped in dough is delicious. And so when black mission figs began popping up in markets, it was without a doubt I’d be making some sort of pie. 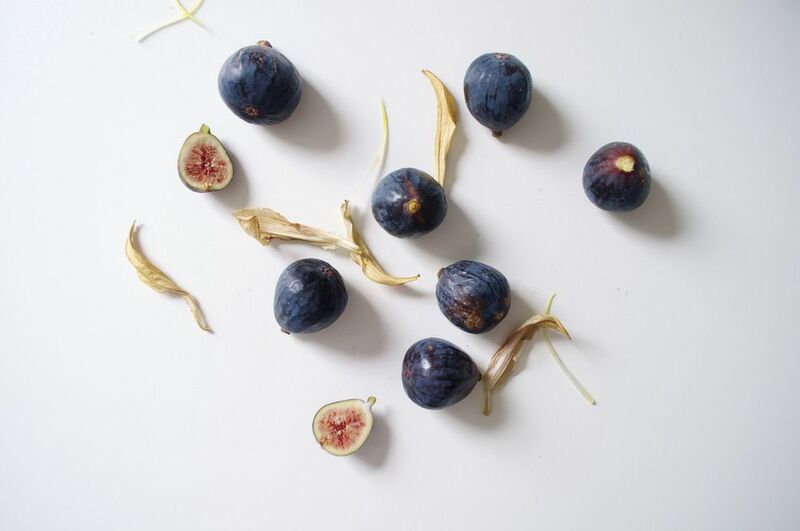 Black mission figs are delicate by nature. They are often prone to diseases during their growth period and the hand-picking process is tedious, which makes them pricey. Their texture is unlike any fruit: the inside is sweet and milky, speckled with small seeds, all held together by a soft-skin exterior. 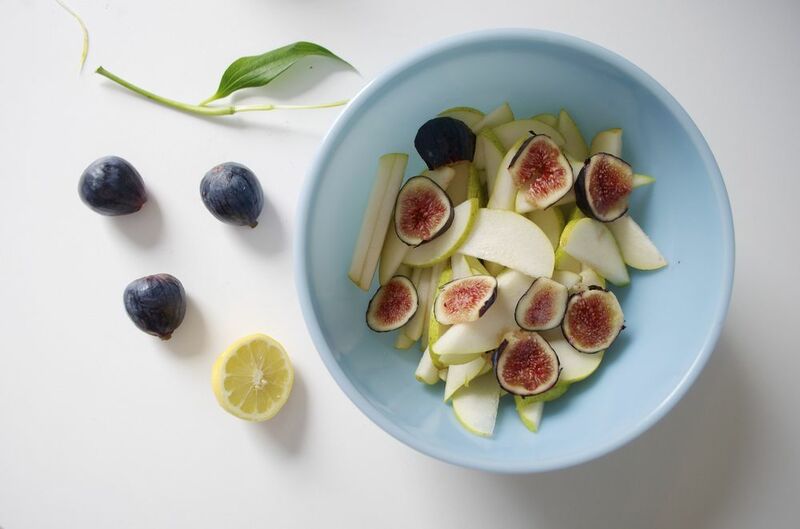 Figs are great for both sweet and savory dishes. 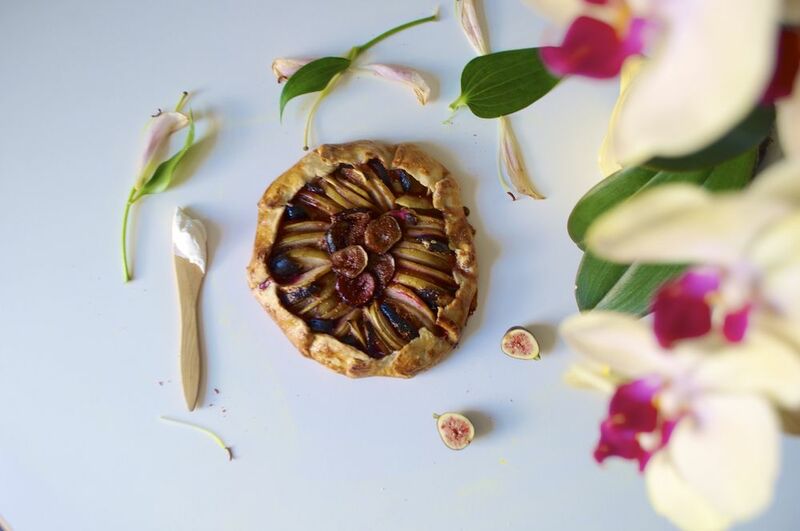 Today I went the sweet route and decided to “pear” them up with pears (pun intended) and make a Fig and Pear Galette. They say galettes are a beginner’s pie. Meaning that it’s the easiest of pies to put together. There’s no fancy lattice crust, no pre-baked pie dough, no tart mold, just a simple, rustic tart that ends up looking beautiful. For this recipe, the filling is quite simple and only requires a few ingredients and a few stirs. The sugar quantity all depends on your taste. If you like things sweeter by all means add more sugar. If the pears are super ripe you can cut back on the sugar. I’d say anywhere between 1/4-1/2 cup of sugar is good for this recipe. The tart is super versatile. If you don’t like pears or figs, you could use any fruit you’d like. All that’s required is: fruit, sugar, lemon (or any citrus/acidic flavoring), a little flour to thicken the filling, and salt. I added some vanilla extract and cinnamon, but you could use any additional flavors you like. A thing to note, which I found helpful, is before baking, once you’ve assembled your tart, pop it in the fridge for 30 minutes before baking. This helps the tart retain its shape in the oven and it’s less likely to fall apart. Also, (and I won’t tell anyone I promise!) you could use store-bought dough if you want. Or if you have a favorite dough recipe, by all means use it! Whatever you do, make sure to have fun! Share your galette recipes on Twitter or Instagram with the hashtag #friedparsley. I’d love to see your creations! *You can also find this recipe on Food52. Woohoo! 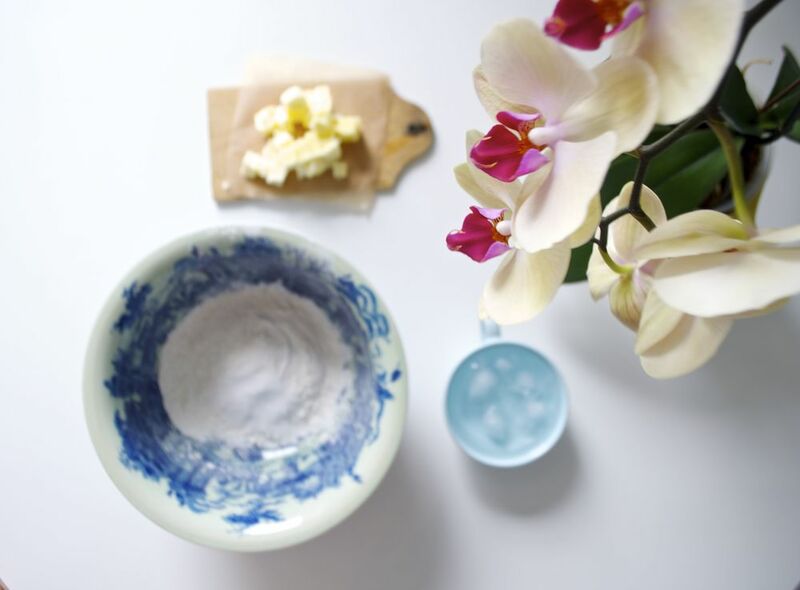 In a food processor, pulse together the flour, sugar, and salt until combined. Add the cold butter and continue to pulse until coarse crumbs form about pea-sized in shape (you still want small pieces of butter throughout the dough - it’s what give the dough its flakiness). With the food processor on, add the cold water, one tablespoon at a time, until the dough comes together. To check if the dough is ready, take a piece of the mixture and press it between your fingers, if it sticks together, you know its ready! Transfer the mixture onto a work surface and form the dough into a disc. Wrap in plastic wrap and place in the fridge for at least an hour or overnight. Preheat over to 400 degrees. Line a baking sheet with parchment paper. To make the filling, in a large bowl, toss together the pears, lemon juice, lemon zest, granulated sugar (sugar quantity depends on ripeness of fruit and your taste), flour, cinnamon, vanilla extract and salt. Set aside. Remove the dough from the fridge. Let it sit at room temperature for 10 minutes, or until it’s ‘workable’ (don’t let it sit for too long, otherwise the butter will melt and you’ll loose the delicious buttery flakes). On a lightly floured surface, roll out the dough into an 11-inch disc. Transfer to the baking sheet. Add the filling onto the dough, leaving a 1 1/2inch border. Arrange the pears in any design you like (keep any remaining juices from the bowl and set aside). I like to add the figs at this point, because they are so delicate. If you try to toss them in with the pear mixture they would easily fall apart. 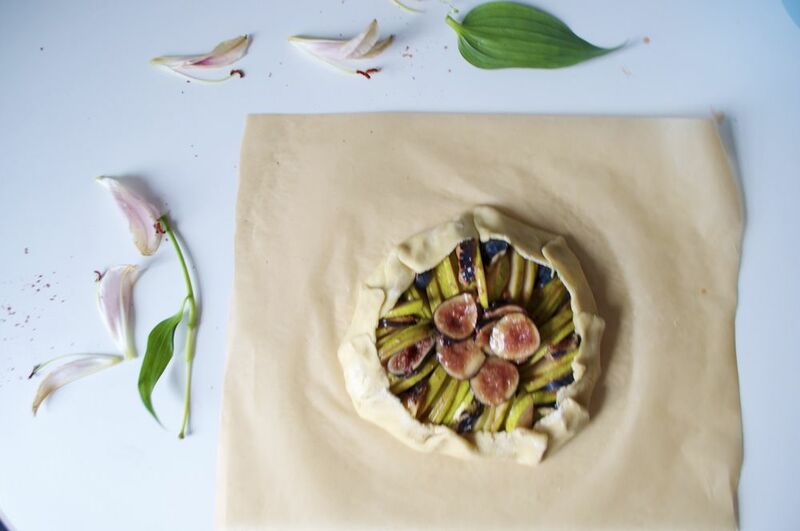 Slice the figs into 1/4 inch slices and add to the tart in any design to like (I interspersedly wedged them between pear slices). Pleat the dough every 2 inches until all sides are folded and the galette has formed. Pour the remaining juice from the pear mixture bowl over the galette. Place the tart in the fridge for 30 minutes to chill. 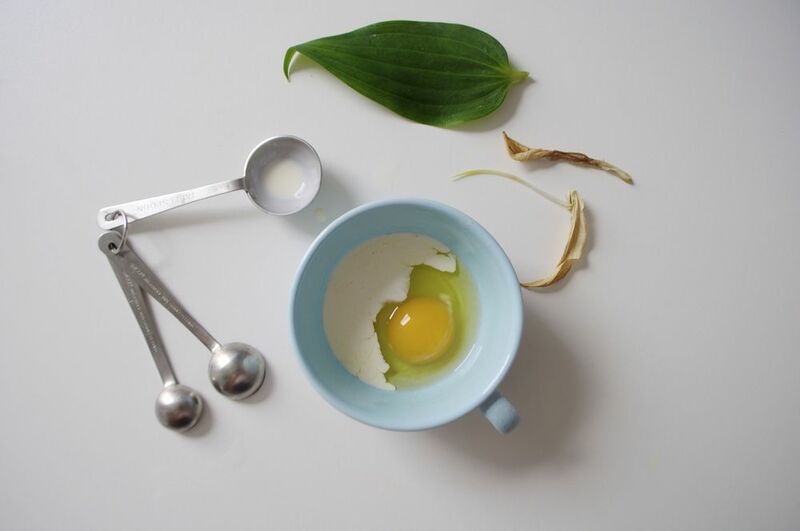 To make the egg wash, beat the egg and heavy cream until thoroughly combined. Remove the galette from the fridge, brush with the egg wash and place into the oven for 40-45 minutes, until the filling is bubbling and the crust is golden brown. Let cool at room temperature and serve with whipped cream and/or ice cream. Enjoy!